The main difference between law and ethics is that one will not get punished for not following social ethics, but will rather get socially isolated, whereas one will get punished for not following the law. Moreover, ethics stand as the fundamental principles for laws in a country. Law and ethics enhance social decorum and standards in society. Consequently, people can lead quality lives with peace and harmony. In a way, ethics and law are related since ethics originated first in society, which then influenced the formulation of the laws. Law can be defined as the system of rules which a particular country or community recognizes as regulating the actions of its members. Consequently, the law is followed by penalties or punishments for the violation of these enforced rules or regulations. Moreover, it is the ruling authority of a country (the state) or community that enforces these particular laws according to the desire of the majority of the citizens; penalties such as sanctions and punishments are enforced on those who do not abide by those laws. By that manner, laws act as guiding pillars for the maintenance of a just and fair society. Hence, the term justice stands as a core term and concept in law as well. Moreover, it is the ruling authorities of a state or a community that creates and enforces these rules and regulations. They can be formulated in the forms of constitutions, treaties, Acts, local laws, statutes, executive orders, etc. Overall, they state what a person should and should not do. Furthermore, the law is something that exists in every aspect of a person’s life. In brief, ethics is a system of moral principles. These contribute to creating morality among the people in a particular society or a community. Merriam Webster defines ethics as “the discipline dealing with what is good and bad and with moral duty and obligation or a theory or system of moral values”. Overall, ethics teach the way human beings should behave. 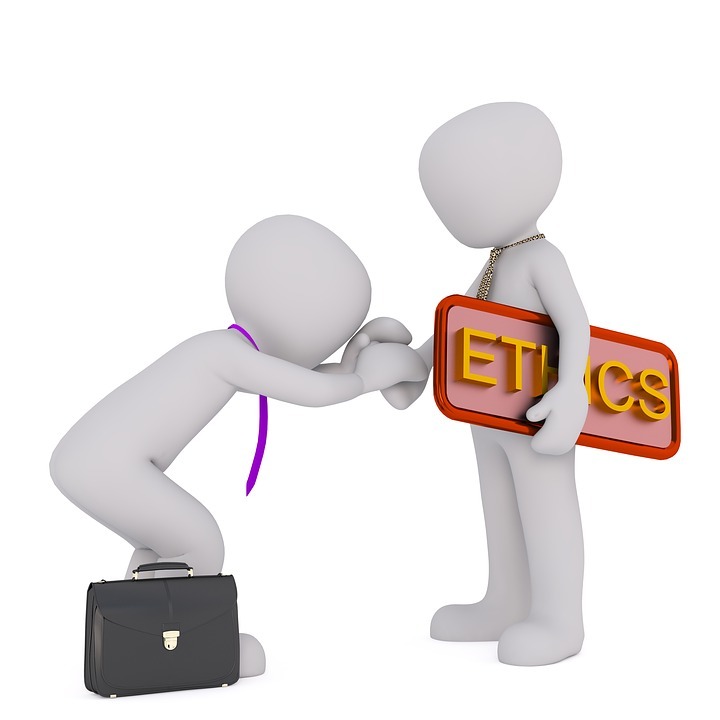 Moreover, the term ethics originated from the Greek word ethos that means custom, character or disposition. Ethics enables us to think in moral terms and work according to moral terms. Likewise, it improves the moral standards in a particular country or a community. Laws framed by the state also aim at the same. Hence, ethics differ according to the individual, his social background, etc. However, ethics defines what are morally good and acceptable from a majority of society. In addition, social beliefs and religious teaching act as the foundation for ethics in society. Accordingly, they aim at guiding people on how to behave in a manner that will benefit themselves as well as others around them. 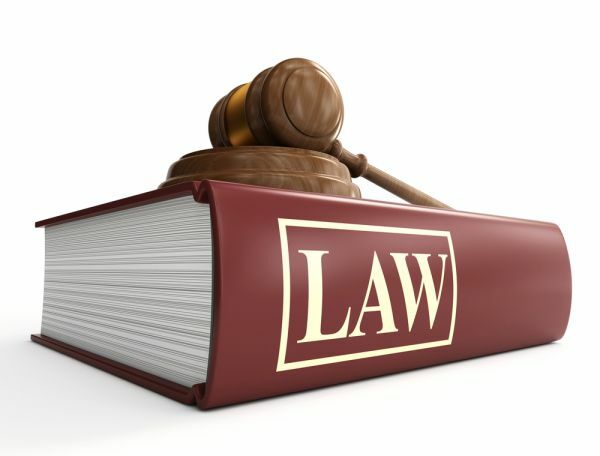 Law is the set of rules and regulations created and enforced by the administrative authority of a society/country with the intention of regulating human behaviour for the common good. On the other hand, ethics are the moral principles that govern a person’s behaviour or the conducting of an activity. 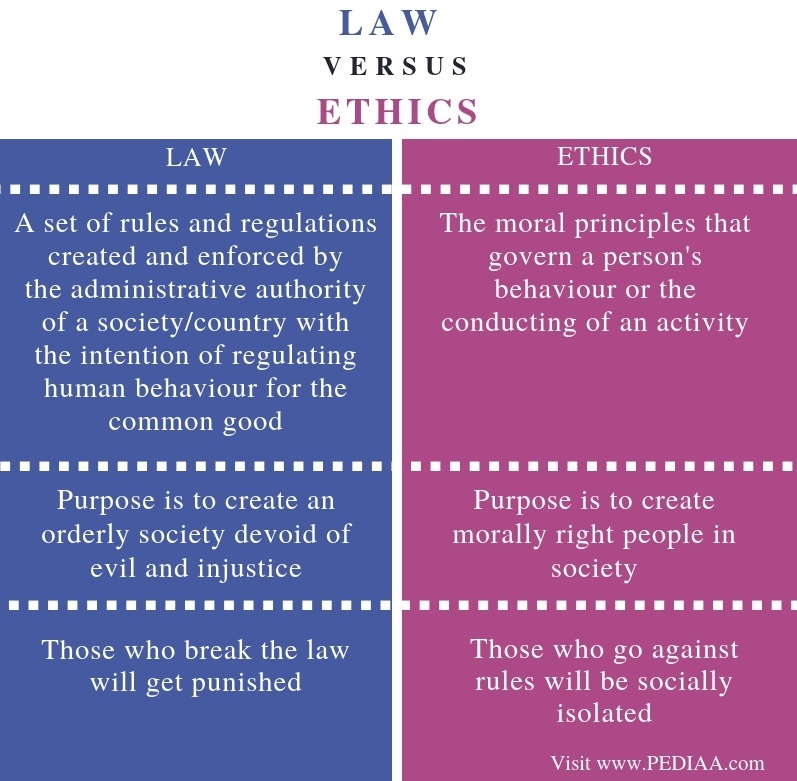 Thus, this is the main difference between law and ethics. The purpose of the law is to create an orderly society devoid of evil and injustice. The purpose of ethics is also the same as law; to create morally right people in society so that it will elevate the spirituality and the overall living standards of mankind. Moreover, punishment is a major difference between law and ethics. Punishment is a core element in law; it aims to create order and justice to everyone while punishing the wrong and highlighting the right. Ethics do not necessarily possess punishments since they are religious and social beliefs and principles. However, those who do not follow the accepted ethics may be considered as immoral or not good by the others in society as well. Law and ethics are essential factors for the quality of life in a community. The main difference between law and ethics is that one will not get punished for not following the social ethics, but will rather get socially isolated, whereas one will get punished for not following the rules. Hence, ethics stand as the fundamental principles for laws in a country. 1. “Ethics – Introduction to Ethics: Ethics: a General Introduction.” BBC, BBC, Available here. 2. “Law.” Encyclopædia Britannica, Encyclopædia Britannica, Inc., 8 Feb. 2018, Available here.